Euskararen benetako misterioa iraupena da, ez jatorria. The real mystery about Euskara is its survival, not its origin. These words, from one of the greatest Basque scholars of all time, Koldo Mitxelena, perfectly capture the current situation of this ‘special’ language. Amongst linguists, Basque—or Euskara—is known for possessing some unique linguistic features, but more importantly, it is especially known for being of unknown origin—a language linguists call a language isolate. Several studies link Basque to early Iberian languages, and propose that it has its roots in a proto-language that was probably spoken in Southern France and North-eastern Spain long before the arrival of the Romans and Latin. Some scholars have also presented theories linking Basque to languages spoken in the Caucasus such as Georgian and Chechen, and even to the Dogon family of languages spoken in Mali. However, just like the origin of the Basque people, a general consensus on the origins of the Basque language is still lacking, and scholars have been unable to prove with absolute certainty whether the Basque people and their language originated in Europe, Africa, or even Antarctica (yes, that’s right). For the Basque people, the health of our language is closely linked to our future as a united nation deeply rooted in our beliefs, culture, and way of living. However, Basque’s linguistic future is far from rosy. To give you a clearer picture of the current situation, only around 800,000 people (or about 23% of the entire population of the Basque Country) are able to speak Basque, together with an additional 200,000 Basque émigrés living outside the area. Indeed, even though Basque is currently being taught in the Basque Country as a subject and used as the medium of education in many schools, the main challenge is getting people to actually use the language! Many of them ask: Why should I speak Basque if the person at the bank office probably doesn’t speak it back to me? How can I speak Basque among friends if some of them do not speak it? Why should I speak Basque if it is not cool to do so? Today, many people, even Basque people, fail to realise that Basque is a language that remains precariously close to becoming endangered. But to understand why, we must look to the long and vivid history of the language itself. Basque is currently spoken in Basque Country, which is known locally as Euskal Herria, the land of the Basque language. A small nation located in the western Pyrenees, the Basque Country is presently politically divided into three regions, with each possessing a different degree of autonomy: two belonging to the Kingdom of Spain (the Basque Autonomous Community and the Chartered Community of Navarre), and one located in the Republic of France (French Basque Country). However, scholars agree that Basque was once spoken across a much vaster area of the Iberian Peninsula and present-day French territory. Unlike almost all our former neighbour languages like Celtiberian and Aquitanian, who disappeared after the Roman Empire conquered the Iberian Peninsula in 218 BC, Basque was surprisingly able to resist much of Rome’s massive political and cultural influence, as well as its reliance on Latin as the common language of trade and administration. Nevertheless, due to that influence, modern-day Basque has many terms borrowed from other languages—or calques—and Latin-influenced grammatical structures. Why did Basque survive? Historians are not entirely sure: it could be due to a lack of Roman interest in integrating the Basque speaking regions because of their inhospitable mountainous terrain, or that the Basque people in those days kept fighting to resist capture. It could also be that both Roman and Basque populations co-existed for some centuries, as Romans settled down in strategic villages but far away from Basque settlements. Whatever the case, it is clear that the Basques flourished after the collapse of the Roman Empire and the conquest of the Peninsula by the Moors, and in the 9th century CE, they eventually re-emerged onto the political map as the Kingdom of Navarre, with their language referred to as Lingua Navarrorum in Latin. Navarre, despite its internal fractures and scarce land and resources, remained stable and wealthy until the pursuit of a unified Iberian Peninsula by another kingdom known as the Kingdom of Leon and Castile began in the 13th century. Leon and Castile, which eventually became the Kingdom of Spain, conquered the southern part of Navarre in 1512. The northern half lingered on for a century more as what has become known to history as the Kingdom of Lower Navarre or Navarre-Béarn, providing a safe haven for refugees from the south fleeing the Spanish Inquisition; however, in 1589, Henry III of Lower Navarre also became King of France after winning the French Wars of Religion, and his son and successor Louis XIII of France finally merged Lower Navarre into the Kingdom of France in 1620. Thus, these events more than 500 years prior laid the foundations for today’s present-day political divide between North (French) and South (Spanish) Basque Country. The Northern Basque Country was initially able to retain its individuality and its use of the Basque language; however, the fall of the French monarchy in the French Revolution of 1789 meant the beginning of centralising nationalist policies favouring the assimilation of cultural and linguistic minorities, and the use of French over all “regional” or minority languages. These have since affected the perceptions of many French Basque-speaking citizens: for example, it was once widely believed that you could not be French if you spoke other dialects or languages. Minority languages were forbidden in schools, while the permanent settlement of a large non-Basque population in areas that had formally been majority Basque (which is known as demographic swamping) was common; other languages could not be used in public places, and stigmatisation was widespread. The North was also never been able to gain recognition for itself as a separate French Department (the French equivalent of a Province or State) with its own language policies protecting the use of Basque; thus, within a few generations, many families stopped speaking Basque altogether. In the South, Navarre retained its status as a kingdom, although it was under the control of (and paid homage to) the Spanish Crown of Leon and Castille. However, although Spain was not initially particularly aggressive towards minorities within the kingdom, in order to create a unified and homogeneous society, the Spanish kings eventually began to stigmatise, punish, and even imprison Basque speakers, while the rise of the Spanish Inquisition resulted in even more Basque people being savagely tortured and killed, causing great disruption to Basque society. The so-called Basque witch trials of 1609–10 were especially destructive, with authorities on both sides of the border attempting to root out and burn Basque “witches” for their heresy against the Catholic Church. Basques on both sides of the border fought fiercely for their rights and their language, but it was not to be. Republican France deported many Basques living in the North, while Spain crushed nascent attempts by Southern Basques to regain the sovereignty Navarre had once enjoyed in a series of conflicts known as the Carlist Wars. Indeed, the Basques in the South found themselves in an even worse position than before as Navarre lost its status as a kingdom and almost all of what autonomy it retained in 1841, becoming a Spanish province. Thus, over centuries of repression, prejudice and stigmatisation, the area in both halves of the Basque Country in which Basque was spoken shrank substantially. As the 20th century began, as a result of popular Romantic ideas emerging from the rest of Europe and a concern for the future of the region, a unique sense of Basque nationalism placing particular importance on the use of the Basque language began to emerge. This was an especially eventful period for the Basque Country: the region was extremely poor, a series of sweeping civil wars broke out between different factions and families, and large numbers of people emigrated to America, while the proliferation of the coal industry also destroyed much of the natural landscape. However, despite the numerous setbacks faced by the Basques over the preceding years, the rise of both Basque nationalism and a growing interest in the Basque language seemed to temporarily halt the decline of the Basque language and identity. Sadly, after the devastating three-year-long Spanish Civil War (1936–1939)—when many Basques had already been killed, imprisoned, or sent to fight against their friends and relatives—the 40-year dictatorship led by General Francisco Franco was even more destructive toward minorities, with the Basques living in the Southern Basque Country being no exception. Many Basque nationalists and revolutionaries and Basque-language speakers were rounded up and imprisoned, while the Franco government’s repressive and assimilationist policies slowly began to reverse the gains that Basque had made in the first few decades of the 20th century. It has only been in the years since Franco’s death, in 1975, that the Basque language has again been able to continue on the long, gradual process to revival. Today, only around 30% of the population in the Northern or French part of the Basque Country are Basque speakers, after centuries of the French un état, une langue (‘one nation, one language’) approach, and the North’s continuing lack of political representation. In contrast, in the Southern or Spanish part, while the percentage of Basque speakers also continues to hover around 30%, the language shift to Spanish has mostly been stayed. This is because in institutional terms, the Basque language in the North has not enjoyed official recognition or protection, while Spain finally extended such rights to the South in 1978 under the Statute of Autonomy of the Basque Autonomous Community. Nevertheless, members of Basque society in both halves of the Basque Country are enthusiastically involved in cultural activities working toward revitalising the language. 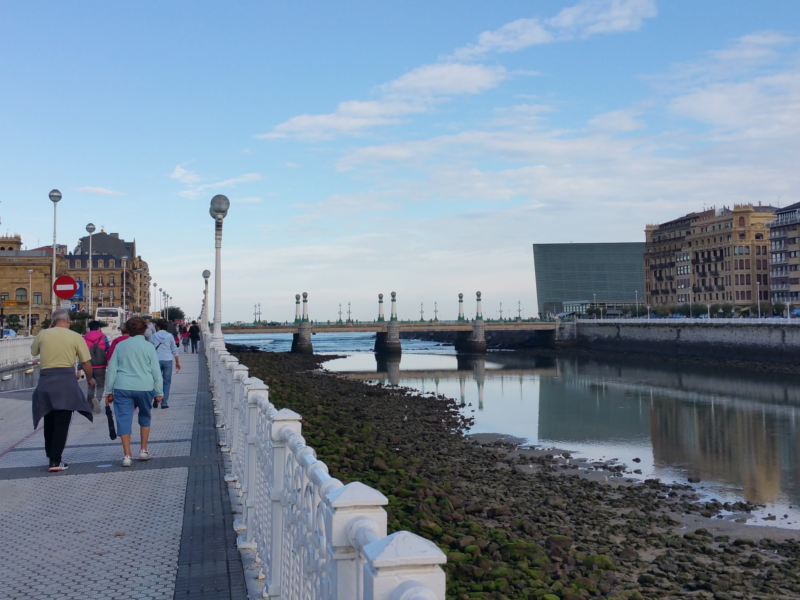 Attitudes towards Basque are also changing for the better, with the language being taught in many schools and government-led initiatives increasingly being held in conjunction with numerous grassroots organisations and societies. Unfortunately, the ongoing centuries-old tension between Basques and Spaniards, and the actions of the armed group known as the Euskadi Ta Askatasuna (ETA), which was set up in 1958 in response to the Franco regime’s systemic state violence against the Basque people, have led many Basque people in both parts of the Basque Country to ask themselves whether they should continue to speak a language that has been unfairly tainted with the label of terrorism or extremism. This has been further compounded by Basque nationalist parties claiming “the need to revitalise the language”, while discouraging non-Basques from promoting the language. Additionally, Spanish and French nationalists continue to rebuke efforts to promote Basque, castigating it as the language of ‘secessionists’ out to make trouble with the Spanish and French states; in so doing, they downplay the usefulness and value of learning the language. Many inhabitants of the Basque Country believe in the legitimacy of one or more of these beliefs and usually have not made any effort to learn any Basque; this group includes many recent migrants on both sides of the border, who moved to the Basque Country in the last 50 years, and who currently form around 30–40% of the population. It should not be surprising, therefore, that many Basque speakers feel alienated within their own land, and have stepped up to revitalise the language. Their efforts are centred on empowering themselves, putting their lives into their own hands, and charting a path for the future where they are masters of their own destiny. One example is the Korrika (‘The Run’) which is held every two years in various cities around the Basque Country to promote the Basque language. This year’s Korrika theme, Euskahaldundu, is especially fitting: it is a play on the phrases “Become Basque” and “Empower yourself”. Although the ideological and linguistic battles over Basque may continue for quite some time, with the end of military conflict in the region, coupled with the burgeoning efforts to celebrate diversity and increase awareness, it seems likely that the Basque language and its people may somehow manage to become strong once more. Of course, Basque has been a language on the defensive for more than six centuries now, but our stubborn and committed ancestors did not let our language disappear. Dictatorships, wars, internal conflicts, and language repression were not enough to discourage us. Even in the face of repeated disappointments and setbacks, we have always sustained the hope that Basque society will ultimately flourish again. Rivers, even though their courses are sometimes diverted, always recover their strength. Yet for Basque to make a truly sustained recovery, it will have to be through our current and future generations’ display of the same spirit of dedication and tenacity that helped us overcome much graver challenges in the past. Present generations of Basque speakers should be thankful to those few brave activists who worked tirelessly for the revitalisation of the language by setting up clandestine immersion schools and underground newspapers, and developing materials in a language that was forbidden. Now, building on the work of their forebears, they too must do their part. There is much to be gained from the amazing and unique features of Basque that continue to fascinate and inspire researchers and linguists from around the world, and still much more to be uncovered about our history. However, I believe we will have plenty of time to wonder about our origins and the distinctive features of our language later. After all, the past only becomes important when one has a future to speak of. The real mystery about Euskara is, indeed, not how it began, or even how it continues to survive today, but how it will grow and thrive well into the future. Beñat Garaio Mendizabal gave up hopes of a career in education to get involved in many pro-Basque revitalisation initiatives in his hometown, Gasteiz, and has just finished an MA in Language Support and Revitalisation at the School of Oriental and African Studies in London. He is particularly interested in Basque and any other endangered languages, as well as language rights, language conflicts, sociolinguistics, and dialectology. He loves sports, reading, chess, travelling, and bertsolaritza (Basque improvised sung-poetry). As a small nation, we are rather unknown, and for me it has become especially exhausting to keep re-introducing myself: “I am from the Basque Country, a small country between Spain and France, which has a unique language and bla bla bla”. With this article, I hope to avoid this situation in future. I love diversity in all its forms and I believe that we should know, at least, a little bit about all the cultures, languages, histories, conflicts, etc of the world. I understand that this is a tall order, but it starts with the willingness to tell and listen. Let's first listen to what small nations have to say about the(ir) world—let's give them a voice. Let's make them less invisible, less small, less trivial. The Basque case is a good example of how power, the fight between big and small states, affects politics, emancipation, history, and conflict, and how language is central to that interplay of events. This article is an enhancing opportunity to discover the diverse world we live in. Ongi etorri!